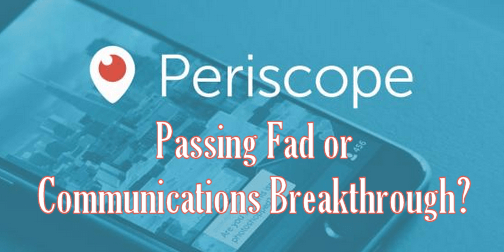 Periscope - Passing Fad or Communications Breakthrough? What’s Periscope? Periscope is new smartphone app that lets you share or experience live video with your mobile phone. It is a live-video streaming service. Twitter was so impressed that it was the perfect compliment to its text message service, Twitter acquired Periscope in January, 2015. It is one thing to “acquire” a company, but to pay close to a hundred million dollars to acquire a new startup — that’s meaningful! Ok, so what does that mean for you and me? Is this just another passing fad, or might it be the next communications breakthrough and Social Media phenomenon? How can Periscope impact you and your life — or perhaps your business? We all know that Social Media Networking has impacted the lives of many millions of people, worldwide. Facebook has worked to change people’s lives. For good or bad, there is no question whether Social Media creates impact. For good, the various Social Media applications, such as Facebook, Twitter, Snapchat, and numerous others, have opened up a line of communications that has reunited long-lost friends, and bring current friends and family members together in ways not otherwise possible. Many forward-thinking businesses have discovered that Social Media can positively impact relations with customers, new and old. I was recently in a meeting with a very successful Internet marketer. The discussion was on an entirely different topic, but he happened to mention that he has been using Periscope in his marketing efforts. Frankly, I was embarrassed to let on that I didn’t know what Periscope was; but if it was something he found useful, I knew I needed to find out more about it. When another person in the discussion matter-of-factly concurred that Periscope was “great,” I realized I had been missing out on something. If you have too — if you haven’t experimented with Periscope, or if you haven’t figured out how to monetize the power of Periscope to give your business a boost, here’s your opportunity to learn all you need to know about it. This is awesome, everything you need to know about Periscope from Social Media expert Kim Garst, the “First Lady of Twitter”. Kim Garst’s name may not be familiar to you (yet) but it is with over 300,000 Twitter users. Kim will show you not only how she gains thousands of followers each month, but how to monetize your following through Periscope. This could be the best $100 investment you’ve ever made. This series of short videos shows you how to most efficiently set up your Periscope account, and use it to build credibility and your following. This compilation of tips, tricks, techniques and insights is a 57-page Ebook filled with useful and actionable information to help grow your Periscope account and your business. This product is from Kim Garst, the leading Social Media expert with a Twitter following of over 300,000 people. Kim will show you her step-by-step system to grow your Twitter community by the thousands, along with a bunch of other secrets. Here’s another product from Kim Garst, sharing her secrets of success with Facebook, where she enjoys a 6 figure following. At this price you cannot afford NOT to learn this stuff.